This is the story of Bill Carter, who, as a young man, went off to war, not as a soldier, but as a confused and grief-stricken wanderer curious to find out the truth behind a conflict being waged thousands of miles away in a place called Bosnia only to rediscover along the way his love of humanity and an aching desire to reach out and help. 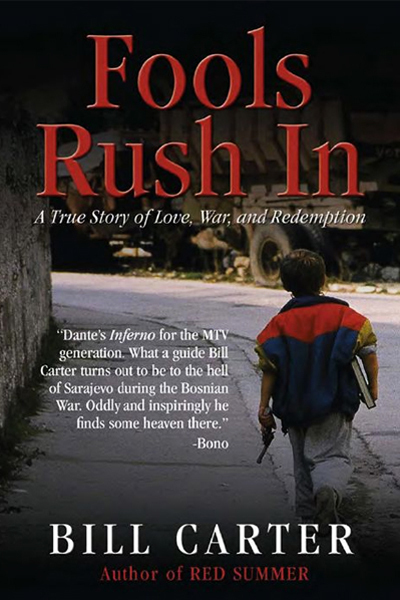 FOOLS RUSH IN is the true account of his courageous efforts, first as an aid-worker with a motley crew of expat punk rockers and thrill junkies, who dressed as clowns to deliver food to the bombed out orphanages; and later as a dogged emissary who convinced the rock group U2 to help bring the story of the siege of Sarajevo to the world via satellite broadcasts beamed out in the middle of their concerts during their world tour. Above all, FOOLS RUSH IN is a memoir of witness, that provides readers with both a searing account of an innocent city under siege, as well as indelible portraits of the people of Sarajevo, who continued to live their lives with hope, humor, passion, and rock n' roll. "Dante's Inferno for the MTV Generation. What a guide Bill Carter turns out to be to the hell of Sarajevo during the Bosnian War. Oddly, and inspiringly, he finds some heaven there"
"After reading FOOL'S RUSH IN, you may find yourselves giving much greater consideration to what in life is important and what is merely trivial." JON KRAKAUER	bestselling author of "Into the Wild"
"FOOLS RUSH IN is a totally admirable book, the memoir of a young man written out of necessity, the only true reason to write a book... its consciousness will become part of your life." JIM HARRISON	author of LEGENDS OF THE FALL and TRUE NORTH. "I can't claim to know what life is about but I know if my life does not entail helping other people, then it is not much of a life at all. I keep a copy of this book near at hand for those moments when I seem to forget who I am. And it helps, every time(f"